You’ll hardly notice when you’ve left Rodanthe and entered the village of Waves, NC. There are no signs delineating the tiny village’s boundaries. One of three villages on the Chicamacomico Banks and formerly known as simply South Rodanthe, Waves, NC, earned its name in 1939 when the village got its post office. The postal service was notorious for changing names of locations, and it is supposed that Waves, NC, got its name from the obvious ocean reference. Other historic names for this village have included South Chicamacomico and Southern Woods. Of course, it’s logical that with a name like Waves, surfing might play a major role in defining Waves recreation. The earliest Hatteras Island surfers found boards in 1962 and had the island’s breaks entirely to themselves. Buxton resident John Conner joined them in 1964. Conner remembers surfing in a sweatshirt and long pants when the water got cold because they had no wetsuits then. By the mid-1960s, surfers from Virginia Beach had discovered Hatteras Island. Conner opened the island’s first surf shop in a mobile home in 1968. In 1969, Surfer magazine did a feature on the waves of Hatteras Island, and that was the beginning of it all (the beginning of the end, said local surfers who were used to having the place to themselves). Hatteras Island Surf Shop opened in 1971 and is still a gathering place for the surf crowd. That was then, this is now. 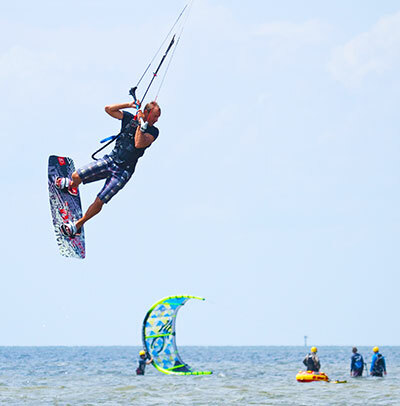 Enter the most popular Waves, NC, thing to do: kiteboarding. Waves is now known far and wide as the epicenter of this wild, wind-driven sport, and there are outfitters with kiteboarding campuses that can get you on the water, offer camps to learn the sport, feed you and house you. Of course, other water sports are popular too such as surfing, windsurfing, sailing, SUP, kayaking, Jet skiing and good old ocean swimming. And, we should give a nod to the ancient sports of beachfront sitting, reading and shell hunting — all part of the appeal of a Waves, NC, vacation due to the lovely beaches this area is also known for. Ok, admittedly, Waves, NC, shopping is not quite an all-day adventure. Folks don't come here for that, as they might to Duck, for example. Still, one of the coolest and oldest surf shops is here, one of the best outdoor adventure stores (that rents equipment too!) is here as well. And, if you like the finer side of cooking (or eating), there's a very popular seafood and steak market that folks from all around come to for top-quality goods. Several galleries are also worthy of your time. For such a small village, the Waves, NC, restaurant scene is great! Some of the most popular Hatteras Island restaurants are here, and you get a lot of variety. In the mood for Asian-inspired dishes? You're in luck. How about a 2-pound burger, tacos, Cajun or Jamaican? NC-brewed beer? A fabulous breakfast or a late-night deli sandwich? Mexican or BBQ? Outdoor dining while you listen to live music? Waves, NC, hotels are pretty simple to choose between. Do you want to camp, or do you want to stay in a luxury soundfront condo? Hey, it's a real question! This area has always been known as a campers choice, and there are tons of visitors who prefer being as close to this barrier island environment as possible. On the other end, the condo unit here is in a resort village that also offers a great restaurant, kiteboarding and shopping. The choice is yours! What's the weather like in Waves, NC? The weather is Waves is going to be the same in Salvo and Rodanthe too since the Hatteras Island villages are only a few miles apart. July is generally the rainiest month with an average of nine days having some degree of rain (many times it's late afternoon thunder storms that pass quickly). Here are two more stats that are interesting: The air quality index in Waves is 21% better than the national average, and the pollution index is 90% better. 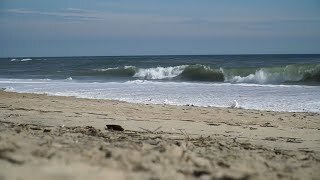 Where is Waves, NC, located on the Outer Banks? Waves, NC, is on the northern end of Hatteras Island, and it's the second town you get to. It's sandwiched between Rodanthe a few miles to the north and Salvo a few to the south. The size of the town is 353 acres or approximately half a square mile. Needless to say, you can walk or ride a bike anywhere you need to go in town. What's the drive time from Waves, NC, to other Outer Banks towns? These times are taking summer traffic into consideration. Are there a lot of vacation rental houses in Waves? Yes! As with the rest of the Outer Banks, the vacation rental houses in Waves are the most popular choice for a stay in the area. Waves has a very good range of houses, from small saltboxes to large oceanfronts. Several local rental companies can match visitors up with a property that works well.